Another storm is heading our way and the snow levels are going to be low. I am getting my greenhouse ready to get seeds and other plants started for my garden. Looking through photos of past Springs I came across this fun selection with one of my Olive Egger chicks. I remember having such fun with this little gal as she posed so pretty for me. I thought maybe you would enjoy this little bit of Spring to enjoy on a leisurely Sunday afternoon. I can’t wait to add some more chicks to my collection of hens this year. I probably need to hatch out some more olive eggers and I now these gals will begin to slow down in production after this Summer. I hope you enjoyed this little smidgen of Spring in a Tea cup. I am slowly getting the stairs done but I am enjoying how they are turning out. I am on the lookout now for more terracotta pots, the succulents have done so well in the first one I did, I want to do more this summer. Your kaleidoscopes turned out neat. Wow you sure are one talented woman. I love the flowers painted on the stairway. How did you get that chick to pose so cute? these are just the calmest little chicks so it was no problem getting the poses. I just set her where I wanted her and she stayed put. Just looked around and chirped now and again. Wow your stairs are coming out great. Love them! She did a good job. So clam and complying. Here in Calif. we have not had much winter, but we have been getting some much needed rain the past few days. This is adorable. 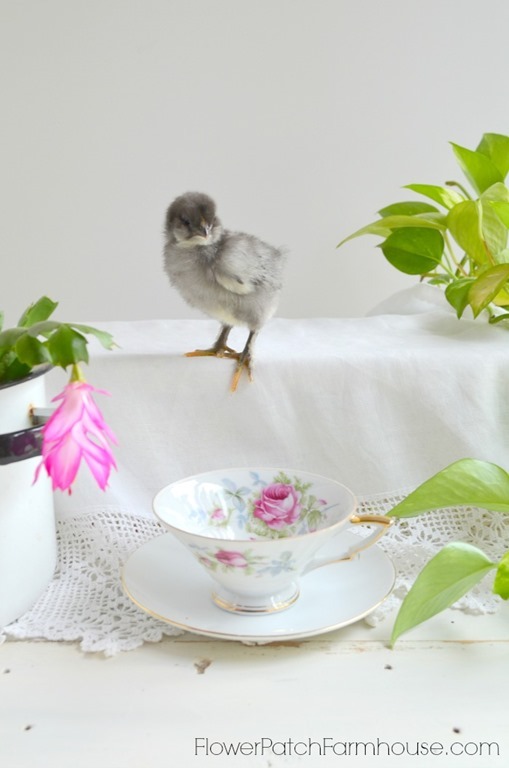 The little chick and tea cup are gorgeous. I did have fun with both. I am glad you stopped by and enjoyed your visit. How long did it take before he pooped in the teacup? LOL! Thank you for sharing with the Clever Chicks Blog Hop! She never did! Shocking I know but she was so well behaved. 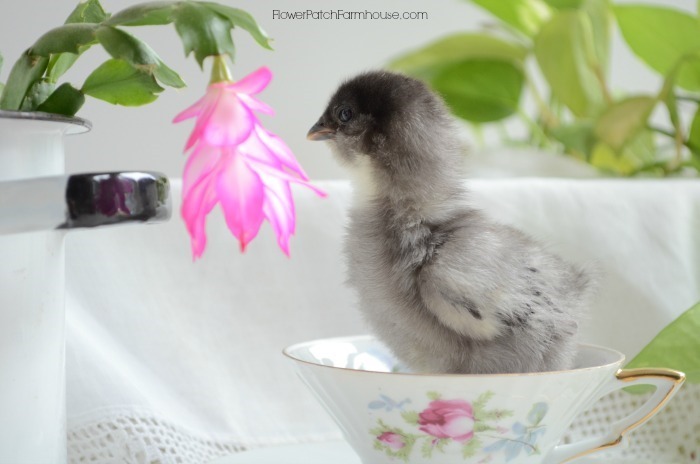 Spring in a teacup — too cute! 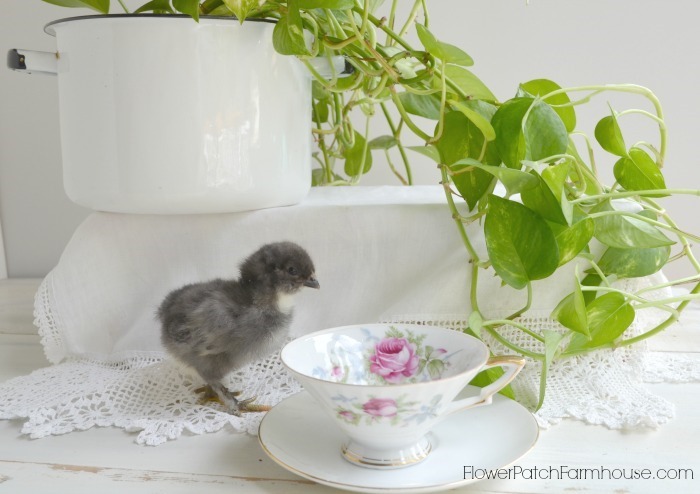 Fun idea to use the chick and teacup. Stay warm. Spring will spring! Happy Tea Day! It is Sunday and I certainly enjoyed pics of your chick. Great to start thinking of spring coming soon. Thanks. We woke to 6 fresh inches of snow! But the rest of the week is to be sunny and warming up so I look forward to that tremendously. 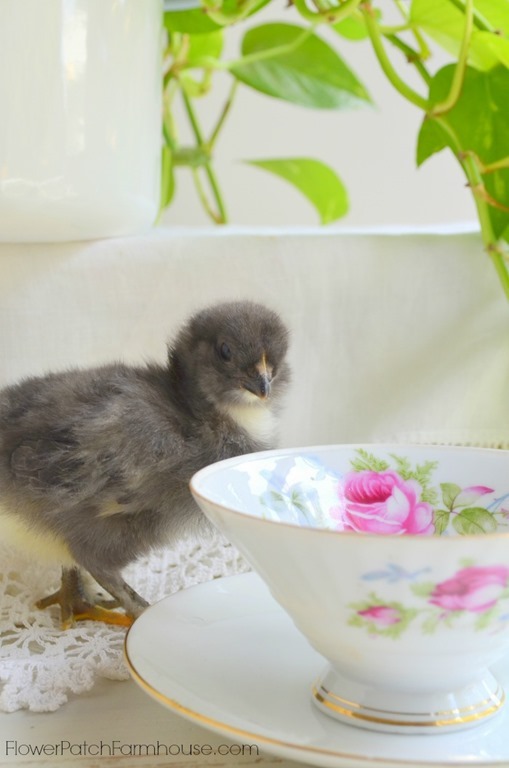 Loved your photos of your sweet little chick Pamela — sooooo cute !!! Doesn’t she just make you smile. Adorables little chick! So sweet to comply! She was very calm but I had handled them a lot from the time they were hatched so she was not afraid of me.